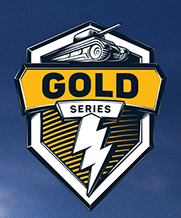 ► Gold Series tournament for Tier IX-X vehicles. Participation Tickets can be earned in the Silver Series IX-X tournaments. The best teams of the tournament will receive Tickets for the Championship Tournaments. Tournament days and start time: Sunday at 7:00 PM (UTC -7). October-November: Desert Sands, Canyon, Winter Malinovka, Castilla, Canal, Himmelsdorf. Every battle is played on one map with changing starting position. December-January: Mayan Ruins, Dead Rail, Canyon, Winter Malinovka, Castilla, Canal, Himmelsdorf, Naval Frontier. Every battle is played on one map with changing starting position. Within the group consisting of 8 teams, players battle in the Bo3 format (until 2 victories are scored) and in the Grand Finals — in the Bo5 format, according to the Double Elimination system. Total groups: 8. First place in the group — a Grand Championships Ticket, Gold Series IX-X Ticket for each team member, 32,000,000 credits, 128 special Crew XP boosters, 128 special Combat XP boosters, and 3 200 Gold, 120 000 spare parts for team. Second place in the group — Grand Championships Ticket, Gold Series IX-X Ticket for each team member, 20,000,000 credits, 96 special Crew XP boosters, 96 special Combat XP boosters, and 1 600 Gold, 56 000 spare parts for team. Third place in the group — Grand Championships Ticket, Silver Series IX-X Ticket for each team member, 16 000,000 credits, 48 special Crew XP boosters, 48 special Combat XP boosters, and 1 600 Gold, 24 000 spare parts for team. Fourth place in the group — a Silver Series IX-X Ticket for each team member, 24 000 spare parts for team. Gold Series on 24 September has been canceled, because enough teams have not registered. Gold Series on 24 December has been canceled, because only 2 teams were registered.